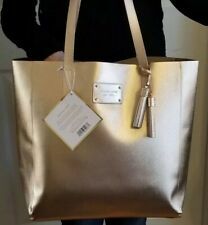 MICHAEL KORS Gorgeous Gold DESIGNER HANDBAG SHOPPER BAG New!!! New!! 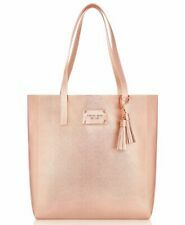 Michael Kors Rose Gold Tote Bag Weekend,holiday, Woman’s Bags!!. Condition is New with tags. Dispatched with Royal Mail Tracked. Dimensions Measuring about 13" x 13" x 6", Wipe clean material Inside pocket This is from The Michael Kors Fragrance range. Comes Brand new all wrapped in paper an original packaging!! Please check out my other items any questions please ask thank you. Gorgeous base shade Mandarin, bordering Orange/ Deep Coral. The bag otherwise is in perfect condition. Michael kors tan leather bag. Condition is Used. Has been well used but still got some wear left, I just got a new one so this is no longer used. A bit grubby inside but not awful. I will accept returns at buyers expense if not happy with it. Postage by royal mail 2nd Class. Michael Kors Black Leather Tote Bag . Condition is Used, the body of the bag is in excellent condition as I have hopefully shown in the photos , however the handles are worn and could do with mending although it can still be carried, with this in mind I am starting the bidding very low . I bought from Selfridges and is 100% genuine . Dispatched with Royal Mail 1st Class. There is a small mark under the lock which is covered when the lock hangs down. There are a few marks inside the bag. As you can see in the photos it has hardly been used and there is no signs of wear on the leather. Black Selma Michael Kors tote bag. v good condition unfortunately, the shoulder strap is missing. Comes with MK dust bag. Bought in "Turkey" lovely bag few marks on cream panel other than that it's in very good condition not real MK. AUTHENTIC BLACK LEATHER STUDDED BAG. SHOULDER STRAP - ONE SIDE WAS RIPPED AND WAS REPAIRED SEE LAST PICTURES. ZIPPED POCKET. LOCATION - NORTH LONDON N22, WOOD GREEN. 2 SMALL POCKETS. LOGO PRINTED LINING. Authentic Black Michael Kors Leather Tote Handbag With Stitch Quilt Detail. The bag does show some signs of wear to the silver metal detail and the handles. Please look at the pictures for detail. However, it is in really good condition and it is still a really beautiful handbag. Selling as I received a new handbag for Christmas. Condition is Used. Dispatched with Royal Mail 1st Class. BRAND NEW Michael Kors brown and classic print leather handbag Perfect for birthdays or personal use Gold Michael Kors branding in front of bag With Michael Kors lining on the inside of bag Comes with adjustable strap Four gold studs on the base of bag Grab a bargain starting at just 99p! If you have any questions feel free to ask :) Check out my other items! Used but still in good condition it has concealed inner bag 100% GENUINE MICHEAL KORS Black Tote / Shoulder Handbag With Inner Bag Size M. Condition is Used. Dispatched with Royal Mail 1st Class. New Michael Kors GWP Gold Metallic Animal Print Tote Bag Beach Bag Shopper. Condition is New with tags. Dispatched with eBay delivery – Shutl 2-3 days. Clasp and hook at the top of the bag if you do not want to leave open. You are looking at my Michael Kors Black ‘Selma’ Handbag in great condition- slight signs of wear on handles of you look closely and on feet on bottom of bag (see pics). Genuine bag RRP £330 @ Selfridges I have the e-receipt (see pics), which I can forward if needed. I also have the long strap which was supplied when I bought this which I’ve never used (as I carry by the handles). I also have the dust bag it came in. In good used condition. From a SMOKE FREE HOME. Dispatched with Royal Mail 2nd Class signed for. Michael Kors Top Zip Tote Bag Acorn Brown Leather. Used. 100% Authentic Genuine MICHAEL KORS Blue Leather Ring Tote Bag - RRP £400 - NR! 100% authentic, or double your money back! Interior has one zip pocket and four slip pockets. Logo Design michael kors tote bag used. Pen Marks inside Condition is Used. Dispatched with Royal Mail 1st Class. Condition is Used. The bag is secured with a magnetic snap closure. 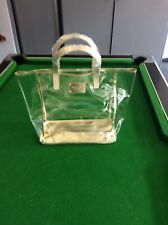 This gorgeous genuine bag is in very good condition. Front gold coloured MK badge and 4 feet on the bottom to protect it. On the back there is a slip pocket secured with a magnetic snap. Michael Kors Tote Bag. Condition is Used, has some marks inside and on the Handel’s as shown in the photos. Dispatched with Royal Mail 1st Class. THE PHOTOGRAPH DEPICTS THE COLOUR (ALTHOUGH THIS CAN NOT BE EXACT) THE SIZE IN TAKEN WHEN THE BAG IS EMPTY AND FLAT, IT IS TAKEN AT THE WIDEST PARTS. ALL THE INFORMATION INCLUDING THE SIZE IS FOUND IN THE ITEM SPECIFICATIONS. Genuine Micheal Kors Tote Bag. Condition is Used. There are a couple of small marks as can be seen on the picture but still in good condition. Dispatched with Royal Mail 2nd Class. Thank you for looking. Condition is Used. The bag is secured with a magnetic snap closure. This gorgeous genuine bag is in good condition. Front gold coloured MK badge and 4 feet on the bottom to protect it. A good example of a versatile, tardis like bag which will look fantastic on your arm or shoulder and has loads of life left in it. 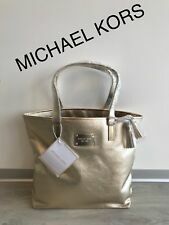 michael kors tote bag grey used. Good condition. Dispatched with Royal Mail 1st Class. BRAND NEW Michael Kors dark beige leather tote handbag Perfect for birthdays or personal use Gold Michael Kors branding in front of bag Comes with adjustable strap Four gold studs on the base of bag Grab a bargain starting at just 99p! If you have any questions feel free to ask :) Check out my other items! Genuine Michael Kors Tote Handbag With Shoulder Strap (can be removed) Condition is Used, Pictures show any marks and wear on bag. Any questions please ask. Other items for sale. micheal kors Genuine large Brown Leather shoulder handbags work tote purse used. Condition is Used check all pictures before bidding because the handbag is showing signs of useage and imperfections on the leather. Nothing major but consider this before bidding. Dispatched Worldwide. Has a long strap which is removable and is 83 cm long. The bag opens neatly with a magnetic clasp and inside has a large zipped side pocket and four slip pockets. Inside is fully lined. The handbag is 42 cm across and 32cm height . A nice piece. From smoke free and pet free home. Michael Kors Cream Tote Handbag used. Used. By in good condition Dispatched with Royal Mail 1st Class. Michael kors black large leather tote bag. Condition is Used. Dispatched with Royal Mail 1st Class. Genuine Michael Kors bag, excellent condition. Comes with MK dust bag also. Any questions feel free to ask. More pictures available on request. PLEASE READ: This item is a WELL USED genuine Michael Kors bag that has been well loved and used everyday. As such it is showing signs of wear on the handle edges (see pictures) and on the lining inside (see pictures) The outside of the bag is generally in good condition with no major scratches or scuffs and therefore may be of use to somebody. Please do not purchase this bag if you are not happy with the description above as no returns will be accepted. Thank you for looking! Michael Kors Tan Brown LeatherTote Bag. VGC. Condition is Used. Dispatched with Royal Mail 1st Class. Michael kors tote bag used. Excellent condition. Condition is Used. Silver studded pattern around fixed handle and in line with seams. Silver metal michael kors badge on outside. Inside leather Michael Kors tag on zipped pocket. Also 2 pockets on other sude. Comes in Michael Kors named protective bag. Width at base 44cm. Depth of bag 27cm. Drop between handle and bag 25cm. Dispatched with Royal Mail 1st Class Recorded delivery. Practical and stylish, Michael Kors women's totes are ideal for everyday use, from shopping trips with the girls to holding your essentials on your daily commute. Michael Kors women's totes are the ultimate sartorial choice. Choose from classic buttery style leather which makes an ideal style investment, or opt for a casual canvas style which is great for durability. Tote bags from Michael Kors can vary in material, colour, sizes and designs. Many styles of Michael Kors tote bags have a main compartment that can be used to store your Michael Kors purse, books, tablets and other small items. You can also find some styles that have multiple compartments, which provide dedicated compartments either within the main compartment or on the side or the front of the tote bag. Some even come with special pockets for your mobile phone, your lipstick, keys or even your wallet. 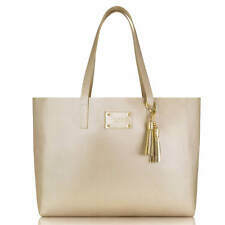 Their women's tote bagscome with either a detachable strap and/or an adjustable strap. These allow you to either wear it over your shoulder or carry it via the bags handles like a grab bag. Going on your holidays? Use your Michael Kors tote bag as your carry on or day bag. The spacious interior will allow you to store clothing, toiletries and other essentials with ease. You can also use these totes as your beach bag, where you can store your SPF, beach towel, sarong and sunglasses in a stylish way. Michael Kors bagscome in a variety of sizes, but most style sizes tend to be between medium and extra large. Closure and fastenings can vary as well; choose from an open top tote or a zipped fastening or snap closure. You can choose from a variety of colours and patterns too, from neutral colours like tan or black to bolder colours such as red and orange. Why not select a floral design or one with polka dots or stripes? Michael Kors is an American luxury lifestyle fashion designer whose first fashion line was launched in Bloomingdales in 1981. Celebrities such as Michelle Obama, Taylor Swift, Heidi Klum and Kate Middleton have worn Michael Kors' designs. His designs have also been worn on screen, in particular by actress Rene Russo in 'The Thomas Crowne Affair' and Gwyneth Paltrow in 'Possession'. Michael Kors clothing combines fine craftsmanship and materials with a stylish elegance and a sporty twist. As well as clothing, Michael Kors has also branched out into a luxury accessories range too which includes sunglasses, watches and jewellery.